INITIALLY, it was a working trip, but arrival in Kampung Rejoi at the upper reach of Bengoh Range in heavy shower was quickly turned into the most memorable Christmas I have had. It was back in 2009, six hours’ trekking in the lush green secondary forests, padi fields, fruit orchards and crossing six long overhanging bridges made largely of bamboo (bhayan in Bidayuh) across rivers — two of them easily more than 50 metres in length. These overhanging bridges are hailed as one of the greatest indigenous engineering feats in the world. The hiking then began from Kampung Bengoh, an old village at the foot of the Bengoh Range (now, one can drive beyond the Bengoh Dam site and begin their four-hour trekking to reach Kampung Rejoi-Nyegol). It was a working trip because we were to find out from Pastor Simo and the village folk of Kampung Rejoi and Bojong Pain the history of the Upper Bengoh settlements first recorded in the Sarawak Gazette (October 1, 1885 to March 1, 1887), publishing a journal writing on the folk and the bamboo bridge between May 1858 and December 1861. For two hours, it was serious discussions at Pastor Simo’s house with more than 30 grim-faced but knowledgeable village elders from the two kampungs, showing and explaining records of their old settlements. No measure of explanation from me and my working partner, Ah Pang was enough for them to accept they should leave their ancestral domain if they failed to prove their native customary rights to the land they have inherited. After a late dinner of indigenous Bidayuh delicacies, prepared by the equally learned hostess Eally, everybody was ready for the customary service for Christmas Eve. The rain had stopped and faces were cheery and glowing from the faint lighting coming from the Church, powered by generator, of course. I sat outside the village Church, not wanting to display my tiredness — certainly not to spoil their service with the most likelihood I would doze off and snooze away. Admiring and enjoying a moon-lit clear sky, I was envious of their living – and angry with the proposed dam project that was threatening to uproot these innocent folk, and most of all, feeling powerless and confused how justice could be best served in this case. I didn’t fall asleep — the moon just got bigger and brighter in the sky and my heart warmed up in the cool mountains, more than a thousand feet above Kuching. It was all because of the blissful reverberation of the guitars and joyous singing emanating from their house of worship. Malaikat, nga jawa bas … Allah kudip manusia, ngapu nyanyi meh atin nga, darum bragah dok kibas! I did not know what it meant back then but it sounded so good and especially loud and merry that I totally enjoyed it and could feel myself immersed in their joyous chorus. I shared his optimisms and was completely dazzled by the conviction and strength in the words of this pint-sized man who had only primary education. We had supper and continued our discussions into the wee hours of Christmas morning — everyone in zest. It was just amazing, how this hope, the only armour they have been holding for the last five years, have seen them weather the communal confusion, uncertainties of legal land tenureship, interlocutory court battles and political intimidations. 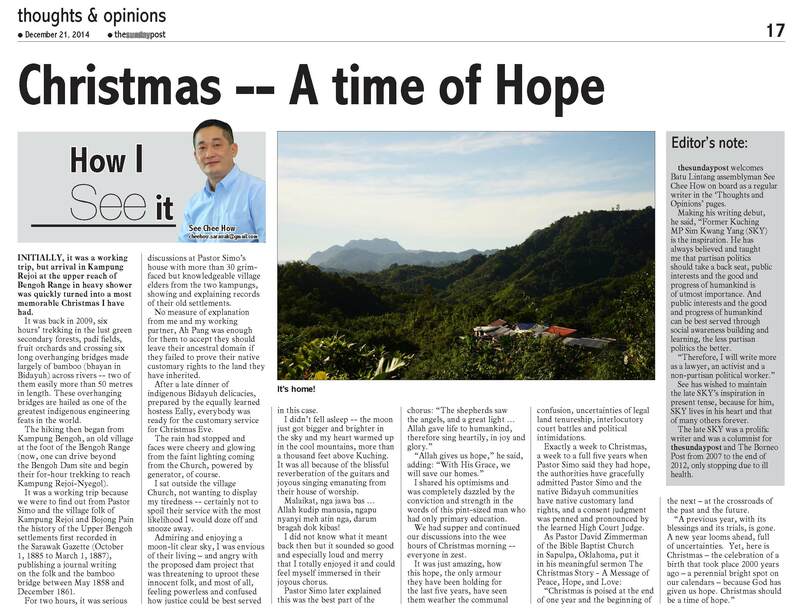 Exactly a week to Christmas, a week to a full five years when Pastor Simo said they had hope, the authorities have gracefully admitted Pastor Simo and the native Bidayuh communities have native customary land rights, and a consent judgment was penned and pronounced by the learned High Court Judge. thesundaypost welcomes Batu Lintang assemblyman See Chee How on board as a regular writer in the ‘Thoughts and Opinions’ pages. Making his writing debut, he said, “Former Kuching MP Sim Kwang Yang (SKY) is the inspiration. He has always believed and taught me that partisan politics should take a back seat, public interests and the good and progress of humankind is of utmost importance. And public interests and the good and progress of humankind can be best served through social awareness building and learning, the less partisan politics the better. See has wished to maintain the late SKY’s inspiration in present tense, because for him, SKY lives in his heart and that of many others forever. The late SKY was a prolific writer and was a columnist for thesundaypost and The Borneo Post from 2007 to the end of 2012, only stopping due to ill health.